Once upon a time, the plane of Alara was shattered into five planes, each distinctly populated with relative mono-magical culture that reflects each of the five colors. Now, the planes are beginning to realign and merge once more. As nefarious forces work to hasten the cataclysmic realignment for their own gain, the populations of once ordered planes struggle to come to terms with a new planar order in which long separated struggles between opposite clash once more; martyrs face executioners, fire and water, earth and air, growth and decay, the innate versus the artificial. Amid this chaos, Ajani, a fierce leonin planeswalker, struggles to bring justice and resolution to his brother's death. Noble warrior Rafiq searches for the source of the of this evil that has invaded his world. And Sarkhan Vol, planeswalker and dragon hunter, taps into a power so pure and ancient, it threatens to consume him even as he revels in its unadulterated totality. 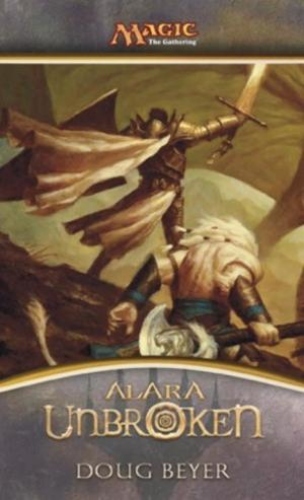 An action packed story from the mind of one of the creators, Doug Beyer opens up the Shards of Alara(TM) set like no one else can.